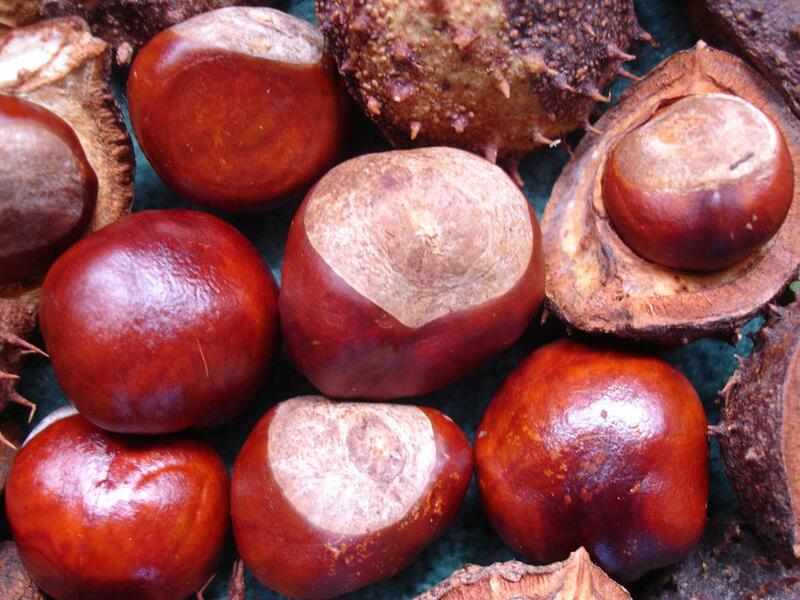 This year many of the village Horse Chestnut Trees are lacking something – Conkers. Thomas and I went out on our annual pilgrimage to find those special little Autumn Nuggets but we came back empty handed and disappointed, last year they were plentiful, the only thing I can put it down to is the hard frosts that we had in spring when the blossoms were out. Not to be outdone I searched further afield whilst Thomas was at school and thankfully found a couple of trees that had some on and collected about 10, which had been blown off. Conkers are little wonders of nature with their glorious rich chestnut colour, glossy coating and beautiful marbling, they grow inside thick and very prickly shells that split open when the conkers are ripe. Thomas was thrilled as he would now be able to play conkers with his friends. Each player needs to have a conker drilled and threaded with string or a shoelace. One player wraps the string around their hand and lets the conker hang down, keeping their arm outstretched. The opponent then needs to wrap their string around one of their hands and with the other hand hold their conker, aim and release it to try and hit your conker. Each player then takes it in turns to hit each other’s conker to try and smash it into pieces. The winning conker becomes a ‘one-er’ if this conker wins again it then becomes a ‘two-er’ and so on. Take care when playing conkers as missed shots could hurt. Happy hunting and have fun. P.S. Thomas didn’t want to drill all of his conkers, he wants to plant some to grow into new trees.